This is turning out to be a wonderful year for butterflies. Pictured above is a mating pair of Northern Metalmarks, female on the right. These butterflies are uncommon in Ohio. 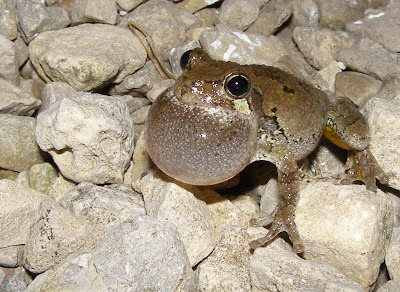 Northern Metalmarks are often highly concentrated in small areas. I counted 10 in a small clearing about the size of the average living room, but could find none in the surrounding area. Sometimes you can walk right by these butterflies without causing them to fly. The easiest way to detect their presence is to stand in one area and use a long stick to gently brush the surrounding vegetation. When disturbed, the Northern Metalmark will make a short flight and settle back onto a nearby plant. Once you get the image in your mind, it’s easy to see individuals sitting around on the plant leaves. They would probably be easier to spot if they displayed the bright orange underside of their wing. Their habit of holding their wings straight out to the sides of their body makes it hard to view the bottom of the wing. Occassionally you catch them in the right position and get a glimpse of the underwing. All the individuals I saw, except that in the first photo, were males. I imagine the males emerged first and the females are just beginning to arrive. This is Round-leaved Ragwort, Senecio obovatus, the host plant for the Northern Metalmark. You don’t find a cluster of metalmarks without also finding this plant. The larvae, adorned with long white hairs, will be noticeable on the host plants later this summer. 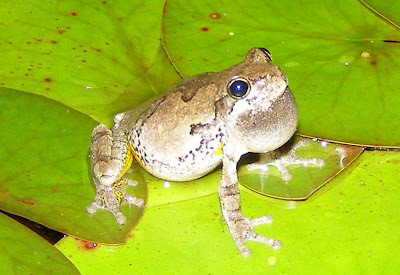 It only takes the possibility of rain to bring the Cope’s Gray Treefrogs out in full force. 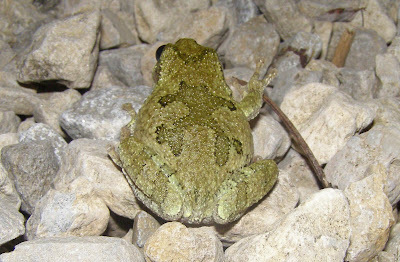 Last night, treefrogs were checking out any cache of water large enough to fit their bodies into. Males were busy calling, announcing that they had claimed a small territory and were ready to mate. Establishing a territory in the middle of a gravel driveway doesn’t seem to be the best strategy for survival. This seems like a much more appropriate place to be calling for females. This photo gives a good view of the yellow coloring on the hind leg. There’s even a little yellow near the front leg. The calling was quite intense. There were at least a dozen males calling from this one area. The sound made my head feel like it was vibrating. This guy looks like he’s got a leaping frog tattoo on his back. 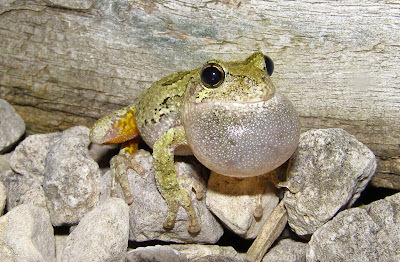 He may be part of a local frog gang. Several frogs spend the day at the top of our house wall, looking like little gargoyles wedged between the brick and the aluminum soffit. Here is the result of the night’s courtship activities. This is a collection of several egg clusters. 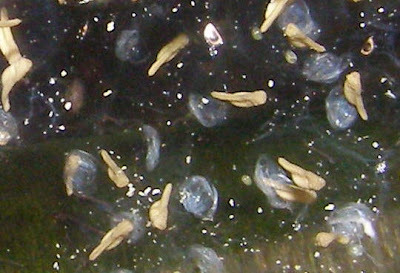 A typical cluster contains three to four dozen eggs. 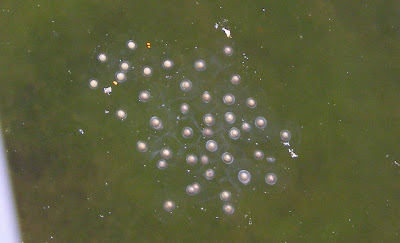 The eggs develop quickly in the warm water. These eggs were laid two days ago and will be ready to hatch in a couple more. 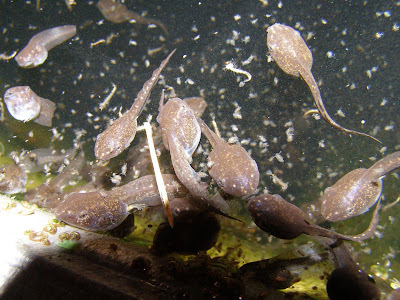 These tadpoles hatched about four weeks ago. This photo was taken at night and I was using my flashlight to focus on my subjects. 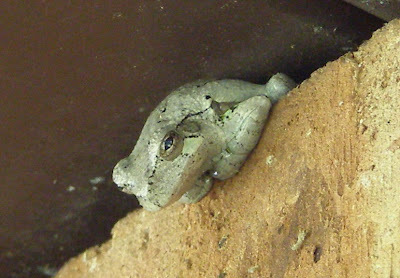 I learned from this activity that Gray Treefrog tadpoles are attracted to light. Most of the specks in the water are daphnia, which are also attracted to light. 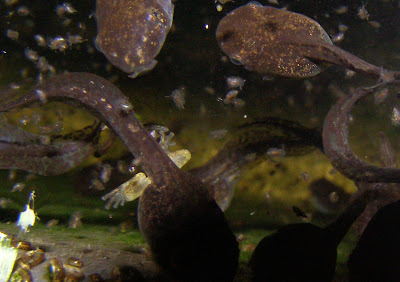 The light did a perfect job of illuminating the developing hind legs on this tadpole. 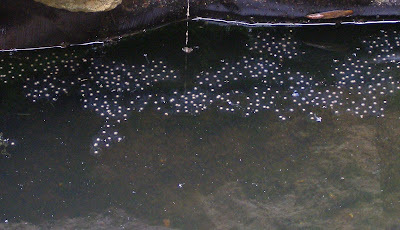 These tadpoles will be turning into little frogs in about two weeks. A nice slow snail for a no hurry Sunday. 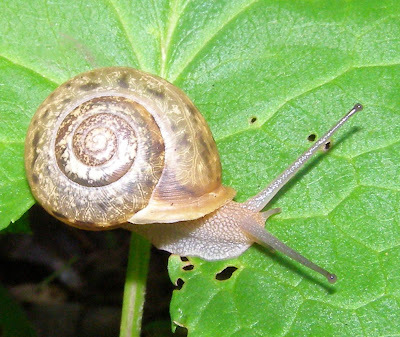 As a kid in Missouri, I read an article about snails that motivated me to spend hours looking for a snail of my own. I found a nice big one and kept it in an old baby food jar. It survived on a steady diet of lettuce, the only suitable snail food my Mom brought home from the grocery on a regular basis. I had kept it for about a year when I was told we were moving to Ohio. Not wanting to leave my snail behind as ordered by my Father, I pushed the jar into a sock and packed it with my underwear. I think my Mother wondered why I was so concerned about my underwear making it safely to Ohio. The snail lived for about another year after the move. There’s nothing like fresh dragonfly in the morning. I found this guy newly emerged from the water garden yesterday morning. This is one of the reasons I built a water garden outside my door. At this stage I can’t make a positive identification. I found him as I was leaving for work so the sun was not quite up. I don’t do very well taking photos in low light levels, so things are a little bit unfocused. That’s similar to the way I feel as I leave for work on a typical Friday morning. This is a photo of the same Dragonfly using the flash. The flash always gives a harshness to the photos, so I usually don’t use it. I think this would have made a really good photo if it could have been backlit by the sun, but I didn’t have time to wait for the sun to come up. Maybe another time. I said I would get out this week and let you know what plants were blooming. The prairie plants are just starting to bloom and most are still a week or two away from coming out. This is Purple Coneflower, Echinacea purpurea, one of the best known prairie plants. If you like fuzzy plants, you’ll love False Gromwell, Onosmodium molle var. 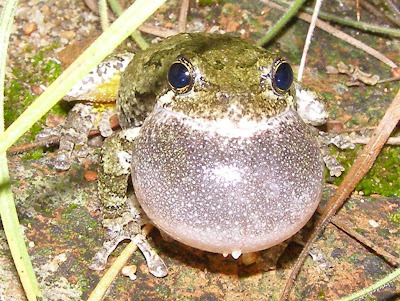 hispidissimum. The bloom isn’t very showy, but it manages to get a lot of insect visitors. This plant has some interesting features that won’t become evident until later this summer. We’ll visit it in more detail then. Blackeyed Susan, Rudbeckia hirta. These are more common in abandoned crop fields where disturbed soil provides a good seed bed. It’s not very common in the established prairie areas at Blue Jay Barrens. Flowering Spurge, Euphorbia corollata, is one of the upright spurges. This plant is very common across the dry prairies. The tall plants sway in the breeze, looking like a swarm of little snowflakes. Most people are more familiar with sprawling weedy spurges of gardens and driveways. Flowering Spurge blooms are composed of a ring of male flowers, each with a single stamen, out of which extends a female flower consisting of a single pistil. The globular object at the end of the right leaning stalk is the pistil or the seed producer. Narrow-leaved Mountain Mint, Pycnanthemum tenuifolium, always looks slightly out of focus when I see it from a distance. I think that’s the effect of all the long, thin leaves. Of course it could just be my eyes. It’s looking a little out of focus as I view it on the computer screen. Prairie Ruellia, Ruellia strepens, is an attractive plant, but the upper leaves often block your view of the blooms. To really appreciate the Prairie Ruellia, you have to get down close to the plant. Unfortunately, these plants seem to grow in the same locations favored by chiggers and you are sometimes left wondering if viewing the flower was worth a week of itchy bites. New Jersey Tea, Ceanothus americanus, is a small shrub that grows in some of the driest areas. Severe winter weather tends to kill back the top growth every few years, so the plant is never very tall. The flowers of New Jersey Tea attract a variety of insects. This New Jersey Tea flower cluster seems to be dominated by ants. Wild Rose, Rosa Carolina, has a tiny bloom that is not very noticeable from a distance. The Pasture Thistle, Cirsium pumilum, is one of the showiest of the thistles. The plant is short, but the flower can be seen from a great distance. Pasture Thistle is also a great attractor of insects. Note the small wasp flying in from the right. I never get shots that good when I’m trying to catch something in flight. When I have the time, I like to spend a few minutes in one loction to see what I can find. I decided to spend a little time at this spot in the creek before the flow completely stops. A nice gravel bar has developed on the inside of the curve where the creek takes a turn to the left. The force of water during high flow conditions is expended against this limestone bedrock on the right bank. The bedrock layers have a definite lean to the left as a result of the meteor strike 300 million years ago. You can get a good idea of the shallowness of the soil over this rock. The exposed roots of the dead cedar stump show how they are stopped by the impenetrable limestone. Here’s the source of the Field Horsetails that are now circling my water garden and charging out across the driveway. The water flow has really slowed in this small pool. It won’t be too long before the water stops moving all together. Small pools like this are often dry by early September. There are several aquatic creatures living here. The easiest way to find the swimming and floating animals is to watch for their shadows on the creek bottom. Water Striders are present everywhere there is enough water on which to float. The shadow shows the size of the dimples made by the Water Strider’s feet pushing down on the surface of the water. Small fish are also present. These are probably young Northern Creek Chubs. The mature chubs make their way up the creek to breed during high water in spring. You can see one fish just below the Water Strider and one a little ways to the left. Some of the Streamside Salamander larvae are still in the creek. The little fish are large enough to cause problems for these larvae. The salamander is big enough to eat the fish if it could catch them, but if given the chance, the fish will feed on the salamander’s gills and any other little parts they can get hold of. I picked up a 3 inch flat rock and found some interesting life beneath. This is a hellgrammite, the larva of the Fishfly. Here's the larva of a Dusky Salamander. It will spend its entire life beneath rocks in or near the creek. I didn’t notice this mayfly larva when I took the picture. I was checking the picture of the hellgrammite and salamander larva when I spotted the image of the 3 tail filaments common to mayfly larvae. You can see the tail on the left in this picture and you can see the eye spot on the right. This particular species is shaped to resist the water currents as it clamors around on the rocks grazing algae. I found a tree that came down in the woods, probably during a wind storm this spring. It’s not uncommon for a tree to fall. The surprising thing is that it didn’t fall across a fence or a trail. The soil on these limestone ridge tops is not the best for growing trees. Limestone bedrock is very near the surface and does not allow roots to form a deep anchorage. As seen in this photo, the roots grow laterally and form a fibrous mat on top of the rock. When the soil is saturated and the wind blows, trees are likely to fall. Examples of this shallow rootedness are found throughout the woods. Shallow soil is not the only culprit. Decades ago, cattle used to graze freely through these woods. The grazing cattle caused soil compaction and root damage, weakening the trees and allowing access for insects and disease. Every time a tree falls, a hole opens in the canopy. The hole allows in sunlight and a flush of young trees will compete to claim the available space. This is what will most likely win the race. This is a seedling Sugar Maple, which happens to be the same species as the one that fell. Sugar Maples will grow faster and with less sunlight than most other tree species. As this cycle continues through the woods, the Sugar Maple will increase its presence to the detriment of the Oaks and Hickories. The years of grazing eliminated the understory of small trees that would be found in a healthy woodland. As more trees fall, the understory gradually returns and provides a more diversified habitat for woodland nesting birds. This is what the area will probably look like in another ten years, if the young trees are not browsed down by the deer. You can see where the Whitetail Deer have eaten the lower leaves and twigs from these Sugar Maples, causing a browse line. The tree that fell isn’t dead. There is still enough soil on the root ball and enough roots in the ground to maintain the tree. From its new position, the tree grows towards the hole it once occupied. It won’t live more than a couple more years. As we move into summer, the root mass will dry completely and the few roots still in the ground won’t be able to supply the moisture necessary to maintain the leaves. The leaves will drop early and the cycle will repeat itself next year, but the tree will die and leave, as a monument to the its last efforts, strangely twisted branches formed by a vain attempt to reach the sunlight. The woodland trees of Blue Jay Barrens are not known for their straightness. Half the woodland pictures I take look as though I can’t hold a camera straight. You can see by the bend of these tree trunks that they were at one time tipped from the vertical and did their best to redirect their growth upward. Eventually their weight will cause them to also come crashing down.